As Georgian wine gets more popular, there is an increasing number of easily digestible online summary articles, and if you want to seek those out I shall leave you in the capable hands of Google. But more surprising for me is the large amount detailed and authoritative information out there. In English too. Here I point out some of the best of these pages, images and documents. 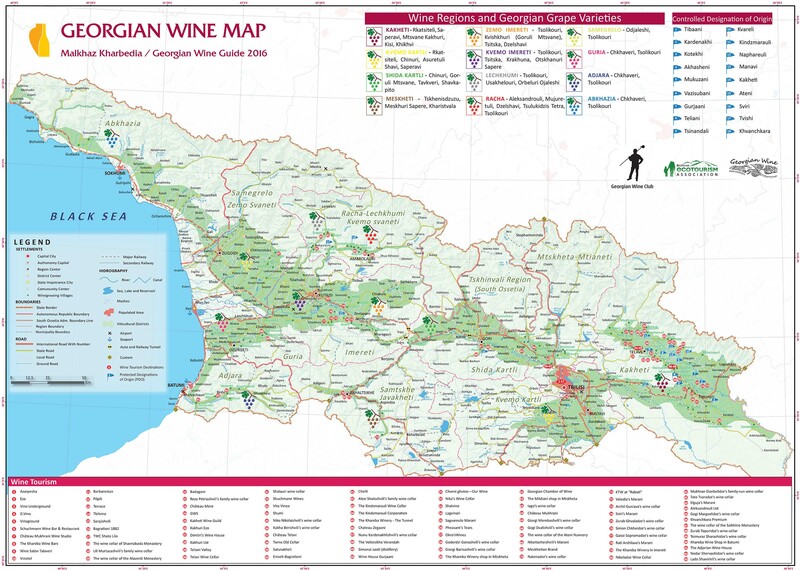 Vinoge.com has arguably the best overview wine map of Georgia, showing the locations of many wine producers, and the main viticultural regions. It is displayed in a rather annoying way in the top right of all pages of the website, but by right-clicking you can open the entire map at high resolution, as seen here. The same site also has a good set of more detailed maps for individual regions, which can all be accessed from this page. You may need to scroll down a bit to find the first one, then keep clicking on the map you are interested in until you eventually you get the map as a high-resolution image. From hvino.com, you may also find this map of interest. The information given is a mixed bag, with various items of interest for Georgian wine tourists. Personally I don’t think it works well as an overview, but is perhaps more useful if you are after something in particular. The soils and climate of each zone are described in mind-numbing detail, but the requirements on grape varieties are only very vaguely expressed. The varieties are listed and described, but then you are usually left to assume that it is those grapes that are allowed in some proportion or other, and others are prohibited. Georgian producers do not seem to be using these AOC names as enthusiastically as they might, but you do occasionally see them on labels so it can be good to know what they mean. Indeed it is good merely to know which AOC names exist, so you do not confuse them for grape varieties. When you have the Georgian AOCs under your belt, you might want to download the 456 page PDF tome Georgian Ampelography for further reading material. There are over 500 Georgian grapes mentioned in the list at the end of this book, but it focusses on the detailed ampelography of only 59, including 4 from France, the remainder all being native to Georgia. In the 1960 edition the main entries were restricted to 57 varieties – a nod to Heinz perhaps? – including 5 French ones. Sadly for wine drinkers, the ampelographic descriptions include little comment on the style and quality of the wine produced by the various varieties. But if you need to grow or identify vines in a Georgian vineyard – or are a card-holding wine geek – this is definitely a book for you. Somehow, even if I am unlikely to read more than a small fraction of it, I feel my life is enhanced by this scholarly work. Finally, for information about qvevri, including regional variations in usage, it is hard to beat the short PDF book Making Wine in Qvevri – a Unique Georgian Tradition. This entry was posted in General and tagged book, georgia, qvevri. Bookmark the permalink.